is now online and free to the public. As a reminder, this publication is under copyright. 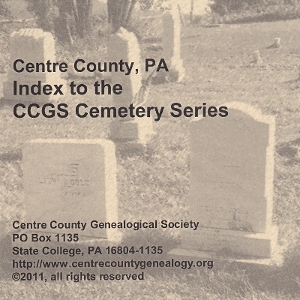 Centre County, PA: Index to the CCGS Cemetery Series (PDF). 2011. Judith W. Heald, compiler. An index to all the names found in the 18-book cemetery series with a key to indicate in which book of the series a name can be found. This index is meant to be used as an adjunct to the books. You will need the actual cemetery series book to retrieve any information on the tombstone. The cemetery series books can be found at the PA Room of the Centre County Library & Historical Museum in Bellefonte and the State College Family History Center, and they are available for purchase through CCGS Publications. For any look-up requests, please email the staff at the PA Room. The PA Room staff will arrange for the look-up in accordance with their fee policy. The CD version is available for purchase until they are all sold at the discounted prices of $10.00 for CCGS members and $16.00 for non-members.